275 September 1949 The WCTU met Sept. 20, 1949 with Mrs. Harlan Luman. Fourteen members were present, or perhaps 16, and one visitor, Mrs. Homer Glattfelder, President of the Lota Sigma of Fairfield. Mrs. McBlain was the program chairman at this meeting, and also presided. Devotions began with silent prayer for the work of the new year, with scripture verses and prayer for MRs. Bartow. Mrs. McBlain reminded us that our slogan last year was "Forward Together," and conducted a drill on the new slogan for this year, "Forward Out of Error, Forward into Light. She also led the group in three flog salutes, the pledge to the American Flag, the pledge to the Christian Flag, and the Pledge to the Temperance Flag. The topic for study for September this year is, "Begin at Home to Understand Our Origination". Mrs. McBair conducted a quiz, with answers: Who is our National President? Mrs. Gerturede Walton of Das Morues. How many departments are there in the work of the WCTU? Twenty three or twenty five, but we are advised that it is better to have five departments and really work them, than to announce superintendents for 25 departments and not work any of them. All the unions are urged to work at least five. Grimnell has more than 5. What great and important convention was recently held in Philadelphia? the NATIONAL DIAMOND Jubilee Convention. 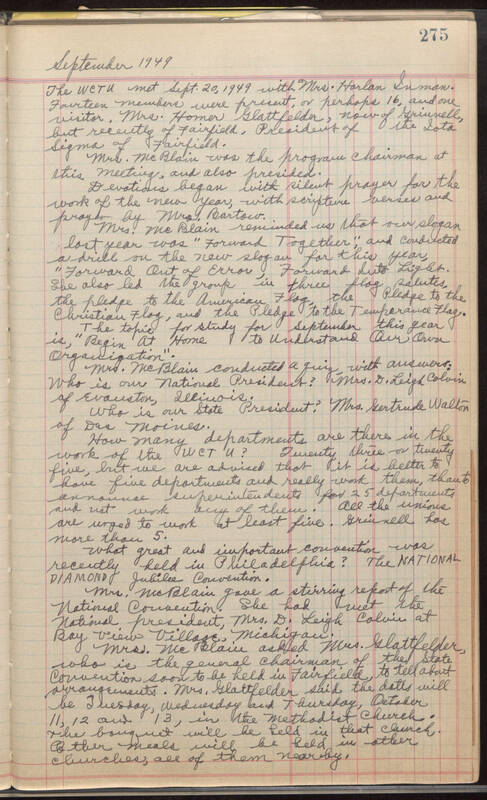 Mrs. McBalin gave a stirring report of the National Convention. She had met the national president, Mrs. D. Leight Colnie at Bay View Village, Michigan. Mrs. McBlain asked Mrs. Glatfelder, who is the general chairman of the State Convention soon to be held in Fairfield, to tell about arrangements. Mrs. Glatfelder said the dates will Tuesday, Wednesday and Thursday, October 11, 12 and 13, in the Methodist Church. The banquet will be held in that church. Other meals will be held i other churches, all of them near by.